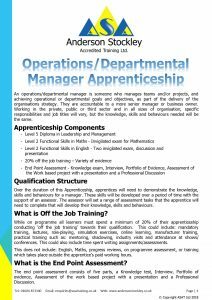 The Operations/Departmental Manager Apprenticeship is for someone who manages teams and/or projects, and achieving operational or departmental goals and objectives, as part of the delivery of the organisations strategy. They are accountable to a more senior manager or business owner. Working in the private, public or third sector and in all sizes of organisation, specific responsibilities and job titles will vary, but the knowledge, skills and behaviours needed will be the same. Over the duration of this Apprenticeship, apprentices will need to demonstrate the knowledge, skills and behaviours for a manager. These skills will be developed over a period of time with the support of an assessor. The assessor will set a range of assessment tasks that the apprentice will need to complete that will develop their knowledge, skills and behaviours. While on programme all learners must spend a minimum of 20% of their apprenticeship conducting ‘off the job training’ towards their qualification. This could include: mandatory training, lectures, role-playing, simulation exercises, online learning, manufacturer training, practical training such as: mentoring, shadowing, industry visits and attendance at shows/conferences. This could also include time spent writing assignments/assessments. The end point assessment consists of five parts, a Knowledge test, Interview, Portfolio of evidence, Assessment of the work based project with a presentation and a Professional Discussion. The knowledge test is designed to assess the knowledge of the apprentice to ensure all aspects of the standard are covered. A series of different scenarios and situations will be used, with a series of questions requiring responses that will demonstrate the apprentices knowledge of each particular topic. The portfolio of evidence will include, written statements, reports, presentations, performance reviews between employer and apprentice, observations, ongoing professional discussions between apprentice and training provider relating to projects and assignments. As well as feedback from the line manager and peers. The work based project is designed to represent the skills, knowledge and behaviours outlined in the Standard. Following the completed project, apprentices will need to deliver a 15 minute presentation relating to the project. The entry requirement for this apprenticeship will be decided by each employer, but may typically be five GCSEs at Grade C or higher. All learners will be required to carry out initial assessments in Maths and English, prior to enrolment on the course. Learners will need to be working a minimum of 30 hours a week to meet the apprenticeship funding guidelines.